Projects - awareNet Theme Song! The VSA thought awareNet really needs a song. But not just any song. A song by the users for the users. A song that reflects the life and the thoughts of its users. 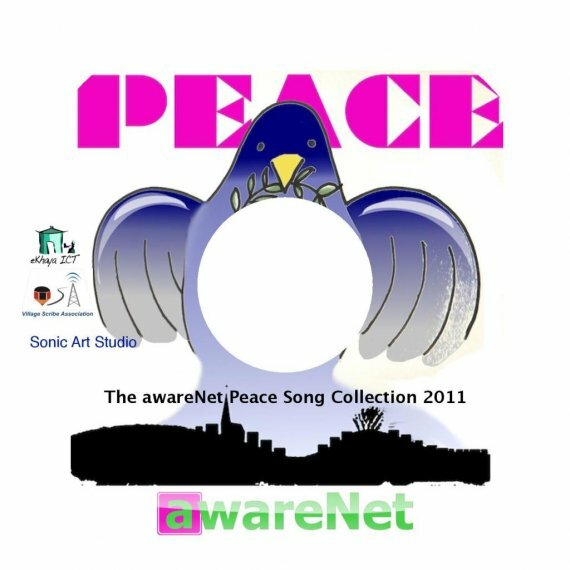 A song that is about awareness, awareNet, about you and me and us, about our life and possibilities, about the future and the Internet, and about Peace. We found 5 schools in Grahamstown that want to take part in this project and want to create a song. We found an artist who is producing a song for us. We found singers, rappers and sound engineers who agreed to practice with the learners how to rhyme, sing and rap, how to perform on stage and who will record them in the end. We found poets who want to write lyrics and more singers who want to create an a capella song together and become the special guests on stage. We found dedicated programmers and mediators who will constantly adapt awareNet to the needs of this project as we go along. And we found people who think it is a great idea to bring all of them together on stage on Peace Day (21/09/11)! Come and join us on this trip! Send us messages and comments, become a member of this project, join the Fan Clubs, spread the message! 1. We are producing a song! 6. A new direction for the awareNet song: HipHop! 7. We start practicing with Inyaniso how to perform a song! 14. The final songs are taking shape! 15. Finally: The awareNet Peace Day Celebration! 16. The music video of the winner! Being played in meetings and events. A chance for this community to learn a thing or two about how a song comes together. And hopefully, enjoyed by YOU! I would like this project to grow and change, so it&apos;s never too late to give me your opinion on what direction the music should take. I will be posting the different steps of the song as it proceeds through its creative stages, under new sections, giving a good idea of how different a song sounds when it&apos;s at the beginning and end of its creation! Interesting, no? I&apos;ll also include a brief description of what I did, why, and my thoughts and ideas. This way, you can give any opinions about each part of the song. Send me any questions you have, I&apos;ll be happy to answer. The first thing I look at, is what&apos;s actually being asked from me, where the song is going to be used, who&apos;s going to hear it, and what they want to hear! So I&apos;m going to do my best to find out what styles of music and which artists are popular with the users on awareNet, but I also decided to get started anyways with what I already know. So, I think Hip-Hop and House are two of the biggest styles in South Africa, so I&apos;m working around then... I then went further, and keeping in mind that the song will be played in and around iXhosa speaking areas, I would love to make a fusion of traditional instruments and rhythm, eg: The mbira, and hand drums / percussion, and somehow combine the old and the new, which is something I believe awareNet stands for. Now that I know more what my plans are, I&apos;m going to open my sound editing software and get my keyboard out, and start with.... the beat! In addition to the new instrument, I also did some rough mixing on the track. If you compare it with either of the old ones, it&apos;ll sound a lot louder, a lot fuller, and a lot clearer, but there&apos;s still a long way to go before the song is fully mixed and finished! Now, in any form of creativity, there is no right or wrong way of doing things, only what&apos;s right and what&apos;s wrong for you, and anything that helps you express yourself, is definitely right. So, even though I can&apos;t tell you what&apos;s the best way to start writing and recording a song, I can tell you that I think the style of music I chose is most heavily influenced by the beat, that I would start there. Selecting a few different drum sounds, from both electronic drum kits, and from recorded sounds of African drums, I started writing a rhythm that is interesting, easy to sing and rap over, and, easy to dance to! It will change by the end, but here&apos;s what I&apos;ve come up with so far: The awareNet theme song beat! Not sounding too bad huh? Stay tuned, this is only just the beginning. Now although I&apos;m not a hip-hop style producer, I still thought the best next step would be to choose a key for the song. A key is a very important part in music and music theory, and it&apos;s the structure around which a melody, and even the whole song is made around. And once I had the key, I think the more important parts of a hip hop track, the core, is the drums and the bass, so I started feeling out a little tune that works together.. It was feeling a little empty, so I then added a very house-style synth on top.. And it starts to separate the background music from the actual tune. Hear what I mean? I then just ended this off with a little fooling around with one of the instruments that will be in the song. It&apos;s a native African instrument called the Mbira, or finger harp, and is used in Xhosa music. The artists are Zukani Budaza, Melikhaya Budaza, Sivuyile Nkhola, Lunga Heleni. They all released several albums and were broadcasted. Find two of their songs here. Do you know them? Corinne Cooper owns Sonic Art Studio and produces music. We are very lucky to have found her! The main input (so far) they gave us was to tell us that there must be no marimbas in this song. !! :-) Do you agree? Let us know. So, Gabriel took the marimbas out and did some major renovations to the song. I hope he will soon add some background information here. In the mean time, listen to the new version of the song and keep in mind that we are still in the middle of the production process. This is another rough, unmastered version, waiting for more comments, critique, input and motivation from you! Today (19/07/11), Zukani, Melikhaya, Sivuyile and Lunga from Inyaniso introduced themselves for the first time at the school along with Corinne from SonicArtStudio and Anna from the VSA. They explained a group of 13 kids (grade 8 and 9) what kind of a project we are planning to do and ask them if they want to be part of it. Responses ranges from surprise and wonder, over disbelieve and shyness, to happiness and excitement. Eventually, everyone agreed to take part in the project and to trust the project. Then, Inyaniso gave an example of their proficiency and started talking about HipHop and introducing them how to Rap. In true African style, when there was a problem with the equipment, everyone went outside to listen to a song by Inyaniso from the loudspeakers of one of the cars. Immediately, the situation loosened up a little, the kids started moving their hips and were much more responsive. They really liked the song and it turned out that one of them already had it on his cell phone, already it is not even published yet. Another example of how much more the kids are connected these days already than their parents. "i like this project because i love music." After a first introduction by Anna and Lunga, it was actually not Inyaniso who performed first, but two Nyaluza kids - and they were fantastic! We could already see how this project can take off. Yeah! Another very different experience. Everyone was on time, we received a list of learners who wanted to take part in the project beforehand, and we were allowed to use a beautiful big space. It felt very special! The girls were very excited like all the other kids before, and they were also very brave and some of them spontaneously performed a song alone or in a group after listening to Inyaniso. Most of them were singing except one or two girls could also rap. All of them were great, and we are looking forward to work again with them next week. After Inyaniso performed one more song for them, there was still time to go to the computer lab. The kids were all new to awareNet, so they got an introduction and had a look at the project, even left comments, voted for the style of the song, made friends and filled out their profiles. Thank you girls for your involvement! The last school that came on board. Today (03/08/11), we went to Mary Waters and were happy to be surprised by the learners&apos; discipline, knowledge, cooperation, team work and interest. All these characteristics will be very helpful to catch up with the work that we have already done with the others schools - some of them we have already seen twice or three times. So, we can report that the learners participated well in a discussion about commercial and underground HipHop. (In one of the following chapters, Zukani will tell you a bit more about it.) Then, they started discussing the issues around HipHop and thinking about the words they want to use for rhyming. They actually accepted homework and promised to come back next week with their rhymes which we will straight away put on awareNet into the related forum discussion. Everyone is invited to give suggestions for lyrics. What do you think we should sing in a song about awareNet? Add your suggestions for lyrics here. Can you make up some lyrics of these words? Are you aware of being HIV positive? Better yet talk the talk! You and I could change the world. Allow the peace and hope to unfold! It could start with awareNet! And find some pictures of lyrics here. Here is now the latest version of the song. The main purpose of this version is to sort of finalise the arrangement of the song, by which I mean, the positions of the all the choruses, and bridges and verses. If there are any specific requests to rearrange some parts, it can be done, but for now I&apos;m sticking with this as the complete song so I can start making all the little changes necessary to finish this thing off. Exciting!" 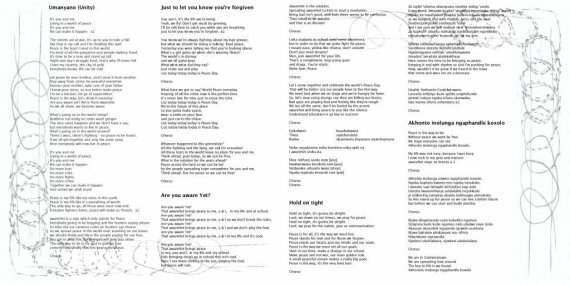 All versions of the song can be found here. To make things even more interesting and exciting, we are also planning an a capella version of the awareNet theme song. For this version we have convinced the Upstart Poets and the 'Boys in Motion' to work together. The Upstart poets want to write poems that will then be sung or interpreted or underlined with a capella music by the 'Boys in Motion'. We are going to meet regularly to work on this project and document it here on awareNet. Click here to find some more brainstorming in our gallery. The song competition is taking place on Peace Day (21/09). Here some news around that day. The Makana Municipality has agreed to sponsor Noluthando Hall for the Peace Day Celebration = song competition. Thank you to the Special Programmes Unit! Erika Wertlen, Jared Lang, Keagan Prince and Roderick Zipp have agreed to be the judges for the song competition. Thank you very much for your involvement and interest! There will be special guests artists who are going to perform one or a few songs: Inyaniso, Keagan Prince and Roderick Zipp! We are very much looking forward to your performance! Corinne Cooper and the Village Scribe Association will provide the prizes for the winners: a professional recording of the best song combined with a music music video on YouTube, and for the best rapper and singer an Inyaniso CD and a pair of head phones. A short film about the awareNet Peace Day Project will be screened at the official Peace One Day Concert at the O2 Arena in London, UK. There will be an article about this event in the Grocott&apos;s Mail issue on the 20/09/11. Y4Y Radio Grahamstown designated two shows to our music event. Listen to us on both Thursdays, 15/09/11 and 22/09/11 at 5pm! Peace Day is approaching very quickly now. This week we started rehearsing at school assembly. Mary Waters was the first school and they rocked! The crowd was screaming and cheering! Well done! Today (15/09/11 at 5pm), a few of our rappers gave an impression of their competence at the Youth 4 Youth Show on Radio Grahamstown. We also used the show to inform about the work of the Village Scribe Association, about awareNet and the Theme Song Project and about our competition on Peace Day. The DJ Khaya alias King of Cool was very impressed and loved the idea! The learners have worked very hard to rhyme during the past weeks. Now, we are busy practicing: rapping and singing and dancing of course. Find same short snippets of it here. 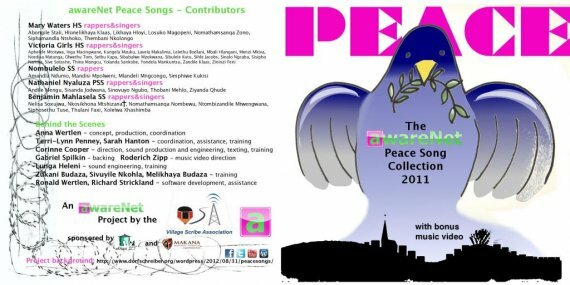 We had a fantastic music event at Peace Day this year (21/09/11), here in Grahamstown-South Africa! We celebrated Peace and awareNet with great HipHop music that was composed especially for this event. It took us only 2 months to get five groups together and train them to perform their own song in the contest while they learned how to use computers and the Internet in a productive and creative manner. In the beginning, we showed Jeremy Gilleyâs short movie about Peace One Day to give everyone the background about our cooperation. Then, there was a motivational message from Sakhile Moleshe, a musician who also grew up in the Eastern Cape and is now an international celebrity. We had great guest artists: Inyaniso, the Boys in Motion, Keegan Too Chilled Prince and Roddy Zipp. The judges, Erika Wertlen from ExPressive ImPressions, Jared Lang and the latter two guest artists who all took their duty very seriously. And last but not least the prizes for the best song (Mary Waters High School: professional music video), best rapper (Benjamin Mahlasela SS: head phones and an Inyaniso CD) and best singers (also MWHS: Inyaniso CDs), sponsored by SonicArtStudio, the Makana Municipality, well and us. We even had to quickly hand out an additional certificate for the best group who showed us true heart and peaceful awareness: Victoria Girls High School. Thank you all for putting so much energy, money and passion into the training, songs and judging! You were fantastic! We loved all the songs so much that we decided that they will all be recorded. We will make an awareNet Peace Day album and turn this into a new tradition here in Grahamstown. Watch out for more next year on Peace Day, 21/09/12, the Day of Global Truce! Find and listen to all the recording here! The VSA organised and Roderich Zipp directed the music video of the winners is the best song: Mary Waters High School!